Spread betting, as a derivative which gives you great leverage of your money, theoretically allows anyone to become a millionaire in a short time. Quite literally, anyone can become a spread betting millionaire in the stock market – but in practice to become rich spread betting you need a fair dose of discipline, patience and some money to start with! 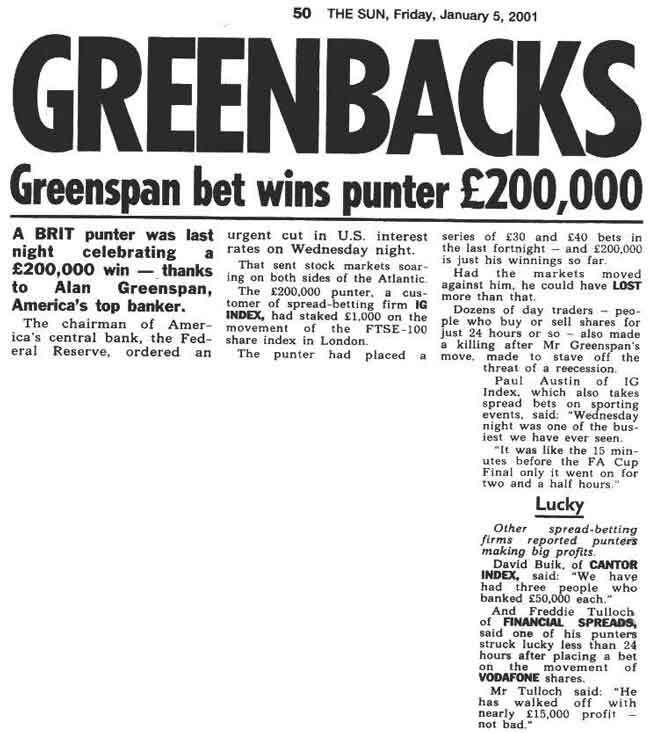 Financial spread betting has been around for a long time now as you can see below from an extract of a London newspaper. Spread trading has become an incredible industry in the UK and with success stories like these it is little wonder. Of course, there are losers, and the fact that the bookmakers are still in business confirms that there are more losers than winners, but trading financial derivatives is still one of the ways that you can realize large profits in a short period. The spread in spread betting, the difference between the buying and selling prices which gives the bookie a profit, means that you need to pick underlying securities that are destined to make a reasonably sized move in the desired direction. The initial part of the move covers the cost of the spread, and the rest is profit. I’ll never have £200m because if I hit a few million I’d happily quit and move to a tropical country to put my feet up for the rest of my days. Why does Carlos Slim want more money when he already has $69 billion? The only reason is greed. Strip him of his cash, give him a pat on the back and £100,000,000 and send him off to retire in comfort. All the poor people in the world would be far better off if we capped the greedy folk. If you want to make money from spread betting then you need to understand what is moving the underlying prices. There is a wide selection of markets that you can spread bet on, and you should stick with the ones that you are familiar with, so that you have a better chance of determining which direction they will go in. There are many books and courses written about trading the financial markets, and it is worth learning about technical analysis as this will give you the tools that allow you to put the odds in your favour when selecting what to bet on. Another point is that spread betting allows you to over stretch yourself and your resources very easily, and the almost inevitable consequence of that is losing your account. This is particularly true for forex trading where high leverage is the main attraction for many small account holders hoping to make a fast buck. The idea that something can make you rich with small amounts of starting capital gives people hope that they can make it. But in reality, no matter what you trade it’s about managing your downside (risk) with a healthy leverage level. One discipline I use is that I only leave £xk in my account and regularly withdraw profits to stop myself from ever losing more than I can accept. With IG they will close you out before zero – it’s happened to me before. Additionally, it is not necessary to be betting all the time, and if you try to you will probably be faced with picking some bets which are not as good prospects as you would wish, and that will reduce your performance. You should wait for the bets that seem to offer the best odds of winning and not try to force the action. One of the keys to making a profit is to not lose too much. In fact, if you concentrate on not losing rather than on winning then you may find that you profit more. The profitable bets will take care of themselves, and you will be actively minimizing the downside, retaining more in your account. Learning about trading will teach you about money management, which will train you to never risk more than you can afford to lose, even if you have a run of losses. One of the lowest risk strategies you will learn is to follow a trend, rather than trying to anticipate the exact moment of a trend ending so you can bet on the reversal in price. Established trends tend to continue for a time under their own momentum, and it is not necessary to anticipate the extreme values in order to capture a profit during the safer main move of the trend. Technical analysis, using indicators on charts, will usually give you a warning of when the trend is slowing and likely to stop. Are there people that actually spread bet as a way of making a full time living? This question in isolation doesn’t really make much sense: it’s a bit like asking “do people make a living using a hammer?”. Spread betting is just one tool among others of the trade (like shares, futures, or options..etc) of playing the market, like a hammer is part of many trades, but few people make a living using hammer exclusively, nobody is a “hammer professional”. so while, yes, people do play the market for a living — that’s what a large proportion of the finance industry is about — it’s likely that very few of them use spread betting exclusively, because other tools are more appropriate in certain circumstances. Market Wizards is full of stock market traders/investors that have all made billions using different trading strategies, instruments and styles of trading including spread betting. Some do not use stops – meaning they can get wiped out. A few months ago Connaught would have been considered by any of his fundamental measures a far more secure company than TW., yet look what happened to CNT. He picks companies that could easily breach banking covenents and end up worthless so he gets his high reward from taking high risks, yet he doesn’t seem to realise it is high risk. He doesn’t say how he would normally take profits. If the market tanks back down to 3500 would he still be holding his long term buy and holders? You could argue its nearer to the trading style of Jess Livermore who ended up making fortunes and losing fortunes, making fortunes and losing it again. He even added to losing positions of wiped out companies in the belief they would recover. He ended up taking his own life and left just $5m which was all that was left (and only because it was in trusts he could not touch). How, when he was trying to offload a large amount of shares, he would ‘manipulate’ the stock price up through judicious buying before selling his stock. Of all the books I’ve read I think his was the best, and most relevant for today, in how the market is manipulated. Some of his observations, such as the reaction of the share price to round numbers and adding to winning stocks are still practiced by stock market traders today. I read a few week ago a new letter from Trading Psychologist Dr Van Tharp – ‘I have never met a winning day trader’. My thoughts were; why would a winning day trader come to see a skrink? Personally I have made money day trading using spreadbetting, long term investments, swing trading but most of all from trend trading (intraday and long term). I lost most money when I didn’t really know what I was up to. Richard J. Dennis, a commodities market trader who was famously known as Prince of the Pit led a group of trainee speculators known as Turtles. In the early 1970s, Richard is known to have borrowed $1,600 and amazingly went on to make $200 million in about ten years. First, let me start by saying that I have a tremendous amount of respect for Richard Dennis and all of the turtles. They have been an enormous influence on my life and paved the way for many successful traders. I have respect for all traders and anyone that is willing to take and assume risk in any endeavor. What I am addressing here is the real story of Richard Dennis. It seems that people have the misconception that his life has been all roses, it hasn’t. His life and career has taken many of the same twists and turns that we all experience in this journey called life. We must be careful whom we worship and put on a pedestal for we are all human. Similar to many Market Wizards and great traders, Dennis has had his ups and downs and bumps in the road. For instance, in 1987 Richard Dennis stopped following his rules and encountered significant losses and was later sued. He made a comeback in 1990 which failed immediately. After a few more years he tried it again and failed again, and this is Market Wizard Rich Dennis we are talking about not some average trader. Trading is a very difficult endeavor and even the best have bumps in the road. I know I have experienced them and it doesn’t make me, Rich Dennis, or anyone else for that matter any less of a human being. The fact remains that trading is DIFFICULT! There are a few that claim it’s easy. My question to them is; if Richard Dennis couldn’t follow his own rules and even when he claims to have done so he was still forced to shut down, how is it easy? The record and reality reflects him closing his doors at least THREE TIMES publicly. Trading, and specifically Trend Following, isn’t easy as some claim, judge for yourself. I can”t make this stuff up! Some say it’s easy and others put their own money at risk and trade. 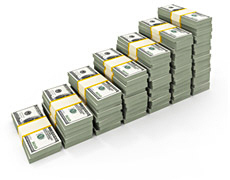 Is it Possible to become a Self-Made Multi-Millionaire Spread Betting? I don’t hear many of these tales! Granted, spreadbetting can be a good lifestyle for many people. But if you want to take your chances at making 200k+ then you are best not doing it from home, you are better going to a trading arcade and paying a desk fee for level 1 access and news flow. To trade spreadbetting from home and want to make 25k I would say you need to start with 10k and be willing to lose it all. Then if after 6 months you still have the 10k you *should* have learned enough to improve your chances of making money. It is not impossible to make money trading but if you are looking for a get rich scheme the stock market definitely isn’t it, unless of course you have years of experience and massive capital. As UK trader Sandy Jadeja points out it would be great to wake up in the morning, put on a trade at a magical number at a specific time, and then walk away to play golf before a relaxed lunch, with maybe a break at a luxurious resort every month but this is not what happens and statistics show that most people who day trade end up losing money. Expect long hours – and I mean long (! ), and expect to make mistakes and have losing trades as well as your personality and maybe lose all your friends! And lastly beware of these spread betting and forex trainers that charge you thousands to listen to them. They are really nothing much more than charlatans. I have had dealings with some and am well aware of the lengths these guys go to, hence my efforts to show them up as the charlatans they are. I have called out several of them in public arenas with clear factual evidence – but amazingly enough people would rather believe that they can get rich quickly! 🙂 Fortunately I never actually parted with money to use such guys, sadly not everyone is so fortunate. Also, the problem with many get-rich-quick systems out there is that there is very little substance and practical guidance on how to make any real money.